Fugoo Tough Incredibly Impressive for The Active Music Fan - Fugoo comes with AC adapter, USB cable, audio cable and storage bag. 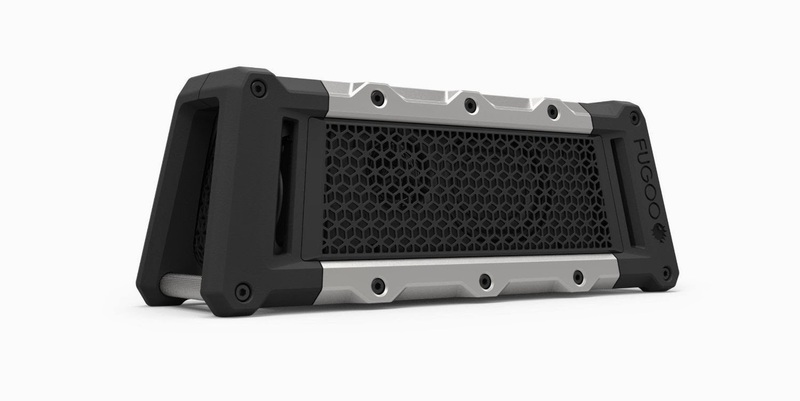 Fugoo bluetooth speaker is designed to go anywhere you want to take your music. Okay, there are a LOT of Bluetooth speakers currently on the market. Landing on the right one for you can be tricky. Let me share how I chose the Fugoo and why it ended up being the best purchase I've made in a long time. I'll admit it, I need help. I'm a music and gadget junkie. I listen to music all the time and I love electronics and gadgets. I recently decided that I wanted a portable speaker that I could take anywhere that could handle whatever I threw at it. I like camping, being outside, being on the water, and having tunes with me is a must. I'm also pretty picky about sound quality and hearing the full range of music. Great sound, Rugged exterior, Water resistance, Long battery life, Attractive design, and Small form factor. The Fugoo delivers on all of these fronts. The sound is crisp and accurate. It has a better bass response than many Bluetooth speakers and clear mids and highs. There are drivers positioned on 4 sides of the device for full 360 degree sound. The Fugoo tough is certainly tough. I haven't abused it too much, but the solid aluminum and build quality give me confidence that this little guy can take a beating and keep on rockin. The Fugoo is waterPROOF to 3 feet for up to 30 minutes. Pretty amazing. Another stat that's pretty amazing is the 40 HOUR battery life! That's no joke either. At mid volume levels I've found that claim to be totally accurate. The fact that the whole thing disassembles for cleaning and to replace the jacket is so great. This means I can beat this one up and make it look new again with a replacement jacket for a fraction of the price of a new speaker. The accessories that are available look friggin sweet. Without going into too much detail, there's a Bluetooth remote, bike mount, strap mount and more. Also, I actually bought the Fugoo and the UE Boom. Yes, the Boom is louder, but at moderate volume the Fugoo is the clear winner in terms of sound quality. The Fugoo was much clearer with better low range and distinctions between instruments. I returned the Boom. If you're in college and getting a speaker for apartment parties, the Boom is for you. 0 Komentar untuk " Fugoo Tough Incredibly Impressive for The Active Music Fan "